The ancients called it Oinoe- Wine Island. This sparsely populated (about 300 year-round residents) southern Cycladic island is quieter than many of its sister islands. Its 2 population centers are Alopronoia, the port on the south coast, and Hora, which is inland 3.5km to the northwest of the port, on a 300-meter high ridgeline overlooking the Aegean to its north. Tradition myths about the island's founding say that Sikinos was named after a Cretan who settled the island, grew grapes, made wine, and invented the Syrtaki dance to honor Dionysus, god of wine. A second story has a man from Limnos, another Aegean island, escaping his home island in a chest after being banished from human communication. The chest landed on Sikinos, where the sea nymph Oinoe lived. They married, and their child was named Sikinos. Sikinos was probably settled sometime during the Neolithic period (around 5,000 BC) from seafarers coming from other, larger, inhabited Aegean islands. Not much is known about the island before the Ionians came about 1,000 BC, and then Dorians from mainland Greece around 500 BC. The pattern of conquest is similar to the rest of Cyclades: Macedon, Rome, Byzantium, Venice, and then the Ottomans in 1566. In 1774 the famous pirate Barbarosa laid waste to the island which led to much loss of life and livelihood. Sikinos was united to Greece after she achieved her independence from the Ottoman Turks in 1832. 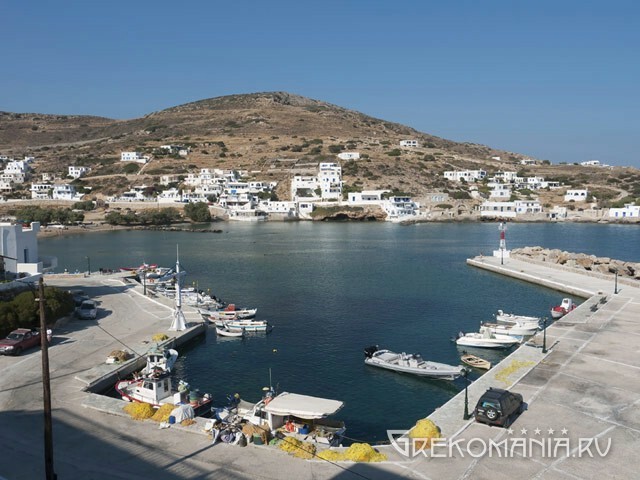 Sikinos is essentially a 2-village island. It has a cliff and boulder-dominated north coast, and relatively more level and gentle topography on the south coast, where the most accessible beaches are. The four best beaches are all clustered together at the northwest end of the south coast, from the port of Pronaia, and then northeast along the coast to the end of the island. This mountainous island's land surface is nearly completely terraced with ancient stone fences serving as retaining walls, though most of the land is no longer cultivated. If you want an off the beaten track kind of holiday, this is the place for you. Quiet, clean, arid, hilly, terraced and tranquil. That's Sikinos. If you look at a map of the area, you'll see that the southwest-northeast orientation of this 14km X 4km island, in contrast to the northwest-southeast orientation of similarly-shaped Folengandras 10km to the west gives the 2 islands somewhat the aspect of a pair of angry eyebrows. The port of Alopronoia, a fishing village of less than a hundred people on the south coast, receives ferries from Athens only about twice a week. Alopronoia's bay is a small inlet about 200m X 200m, with about half the houses clustered near the ferry landing on the west, and the other half on the east shore, with an open, un-built space in the middle, which is where the village beach is. It's a very pleasant, sandy beach, and the only organized beach on the island. The water is completely, beautifully clear, and the beach is almost never crowded. There are a few pensions in Alopronoia renting rooms, and some simple tavernas. Boat excursions around the perimeter of the island are available. A favorite summertime activity of the locals is nocturnal squid fishing. Small as it is, this is where to go if you want any nightlife on Sikinos. A 3.5km trek to the northwest on one of the island's two paved roads takes you to Hora (Sikinos Town), which, because of its location on a ridge, gives a magnificent view of the rest of the island, and of the sea to the north. Hora, like Alopronoia, is divided into two sections. In this case they are two distinct settlements- the Castro (Citadel) on the west, and the Horio (Village) on the east. By the way, there are very few cars and busses on Sikinos, which keeps the air pure. The traditional donkey transport system predominates here. The Castro dates from the 15th century, when the Venetians were running things on the island. Its walls are right on the lip of the ridge, affording a great view of the surrounding area. It is refreshingly un-commercialized, with authentic Cycladic tavernas, kafenia, and a few shops. The church of Panagia Pantanassa (Most Holy Queen of All), named after a miracle-working icon at the Vatopedi Monastery at Mt. Athos, is a late 18th century, blue-domed structure on the Castro's main square. The Byzantine Museum of Sikinos is in an renovated older building on the southwest portion of Castro named Paraporti. Several icons from the Byzantine era are on display, some of them from now-closed churches on the island. The Horio, about 100m to the east, and slightly lower in elevation than the Castro, is a bit more developed, with the twisty, zigzagging streets and alleys typically found in Cycladic villages. What's nice about these sorts of streets that have grown organically over the centuries is that you never know what you'll find around a corner- an old, well-maintained whitewashed house, a flight of whitewashed stone steps, a hidden platia with a spreading, wind-sculpted juniper tree offering shade, or a chapel with a barrel dome. To the east of Horio, up a 300m-long stone path which takes you 100m above the village, is the Monastery of Zoodochos Pigi (Life-giving Spring), with its 17th century church. It's the central religious site on Sikinos. This whole layout is very similar to neighboring Folengandras, which you can clearly see in the distance to the west from the monastery or the village: Folengandras also has a village on a ridgeline on the northern part of the island, and a twisting, stone-paved footpath leading upwards to the east to a religious shrine. The monastery is built on the bedrock of the mountain, its facade a double-winged whitewashed wall, with a double-arched bell tower surmounting the entrance. The monastery was built in 1690, and closed in 1834. Its defensive walls provided cover for the villagers when pirates attacked. Down the steep incline of the northern face of the ridge from the Monastery of Zoodochos Pigi , at sea level is the Mavri Spili (Black Cave), the largest in the Cyclades, and accessible only by boat. At the end of the road about 3.5km southwest of Hora are the ruins of the 3rd century, AD Temple of Episkopi, thought an ancient temple to Apollo, it is now believed to have been a Roman-era mausoleum. During the early Byzantine era it was retrofitted into a church with an added trullo (dome) and bell tower. The church closed in the 1600's. Other than the already mentioned only organized beach at Alopronoia, Sikinos has some very nice beaches along its south coast. Following the coast from the port, after about 2km you come to Dialiskari beach, about a 20-minute walk along the packed dirt and stone path which goes over the 100-meter rise of a headland. It has some permanent umbrellas, and a stone and rock-bottomed sea which may walking into it a bit of an adventure. Another 1.5km up the coast is Agios Georgios, but you can't get to it unless you either take a boat, or take the road up to Hora and back down to Agios Georgios, an 8km trip. It's the only other beach on the island with really nice sand, and that's where the residents of Hora go to swim. There's a taverna close by but no other facilities. There may be a resort built at Agios Georgios in the future. The small cove of Malta beach is almost at the northeast tip of the island and is only accessible with a boat. It's a nice, very small beach which has some ancient ruins on the crown of the hill whose headland marks the tip of the island.